Angelena Campobasso's Creative Native jewelry will be featured in the upcoming Creative Native Fashion Show. The last time her picture was taken professionally, she was 27. Now, on the cusp of 50, a fresh-faced Angelena Campobasso is trying to recall the old poses and once-simple expressions for her upcoming Inlander fashion shoot. "It's been so long," she says, brushing away her dark, flowing hair. "Are you sure we can't have one of my models do this instead?" Used to being behind the scenes these days, the entrepreneur has taken her former modeling training and jewelry business and turned it into a whole new realm, Creative Native Consulting. This weekend, Campobasso takes the brand further, putting on the Creative Native Fashion Show, the first Native American fashion show of its kind in the Pacific Northwest. Having showed at the Runway Renegades fashion show last month at the Convention Center, Campobasso's Airway Heights ranch-style house is overflowing with intricate earrings and necklaces and garment bags full of evening gowns and furs. On a recent morning, with her two kids at school, one of her models is set to swing by soon for a fitting. "This is really hard," admits Campobasso, her own handmade pieces glimmering on her arm. "I'll wake up at 2 am worried about things, that it won't get done. I'm exhausted. But I also know I need to do this, because a show like this has never been done before." The fashion event includes Native men, women and children as models (all of varying sizes, Campobasso says) showing for a dozen Native designers, including her own jewelry line. Some traditional designs will be on display as well. "We have so many talented people, and I'm always telling them they should start a business," Campobasso says. "This offers a good start." Growing up on the Colville Indian Reservation, there was no makeup or boyfriends allowed in her home, and Mass was required every Sunday. 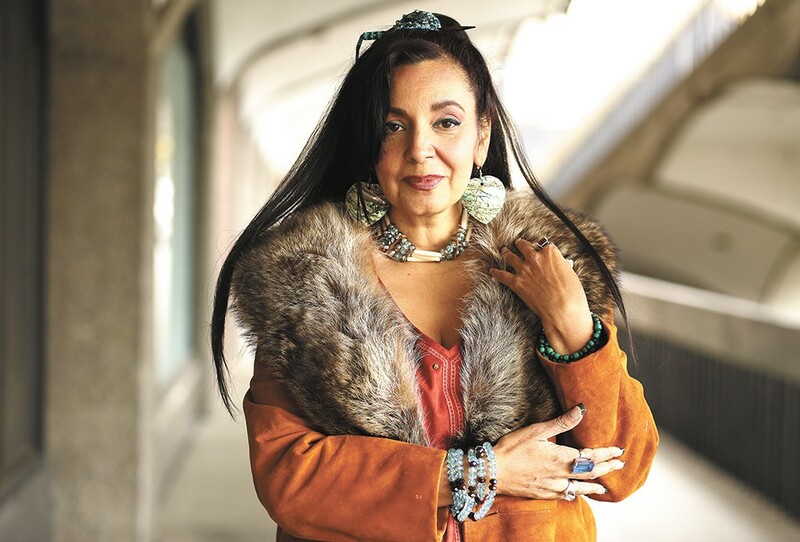 But art was always encouraged, and after learning to make traditional jewelry — "it's not just fashion, some of it is weapons, too," she says — she started her own business at 18, fusing styles old and new. "I've always liked bling," she says. "My grandma bought me a tray of rings when I was little, and I can't remember not being enamored with it." Her own jewelry, crafted carefully on her dining room table, weaves in buffalo bones and leather and things that sparkle. She also works with silver and gets her beads from as far as Albuquerque and Denver. Pieces take anywhere from hours to weeks to complete, depending how intricate the beadwork. That the Native American influence is so prevalent in today's fashion trends — whether that's fringe, feathers or tribal patterns — doesn't bother her. She sees ethnic diversity in clothing as a positive, and says that some of her own work has been influenced by African cultures. As her next appointment walks through the door, Campobasso reflects.